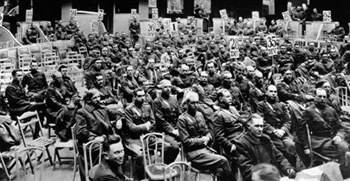 The American Legion was chartered by Congress in 1919 as a patriotic veterans organization. Focusing on service to veterans, servicemembers and communities, the Legion evolved from a group of war-weary veterans of World War I into one of the most influential nonprofit groups in the United States. Membership swiftly grew to over 1 million, and local posts sprang up across the country. Today, membership stands at over 2.4 million in 14,000 posts worldwide. The posts are organized into 55 departments: one each for the 50 states, along with the District of Columbia, Puerto Rico, France, Mexico and the Philippines. "There shines the Emblem of The American Legion, it is your badge of distinction, honor and service. It stands for God and Country, and the highest rights of man. Of its several parts, each has a meaning." The rays of the sun form the background of our proud emblem and suggests the Legion's principles will dispel the darkness of violence and evil. The star, victory symbol of World War I, also symbolizes honor, glory and constancy. The letters "U.S." leave no doubt as to the brightest star in the Legion's star. The larger of two outer rings stands for the rehabilitation of our sick and disabled comrades. The smaller inside ring denotes the welfare of America's children. for a list of our needed volunteer opporitunities. 9:00 AM. - 4:00 PM. 9:00 AM. - 2:00 PM. Sat - 3 pm - 12 pm.